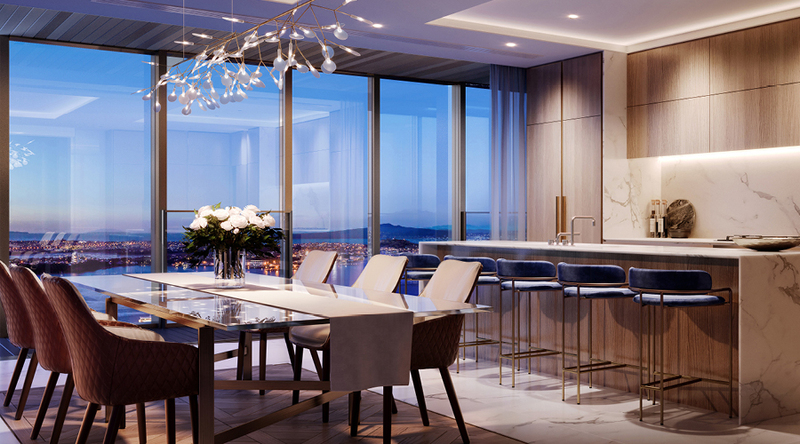 To say that we have high expectations for Auckland’s newest construct would be an understatement. 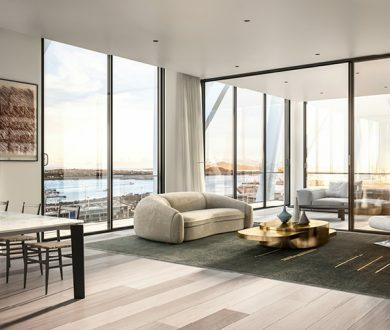 Set to dwarf the city with its 187-metre-high stature, Seascape will stand stoically as the tallest residential building in Auckland — second only in height to the iconic Sky Tower. Sitting adjacent to the Britomart precinct, its captivating design, the brainchild of developers Shundi and Peddle Thorp Architects, will comprise an angular glass facade and a lattice mega-brace. 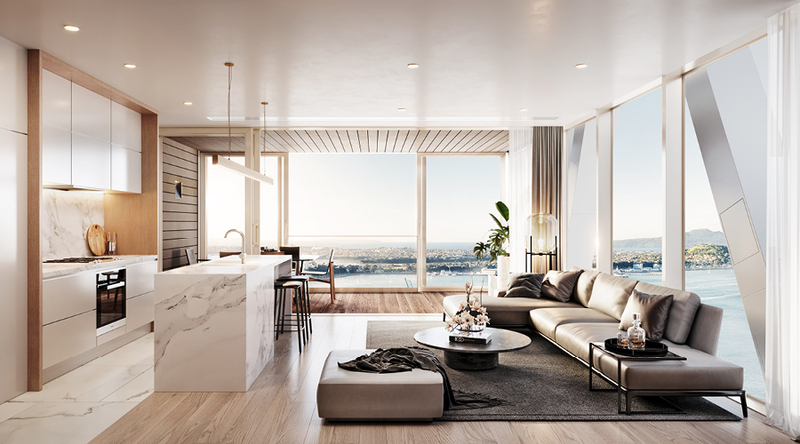 Constructed with Auckland’s stunning harbour in mind, Seascape (as the name suggests) will deliver some of the finest views over the Waitematā Harbour and Hauraki Gulf via its premium, north-facing apartments. 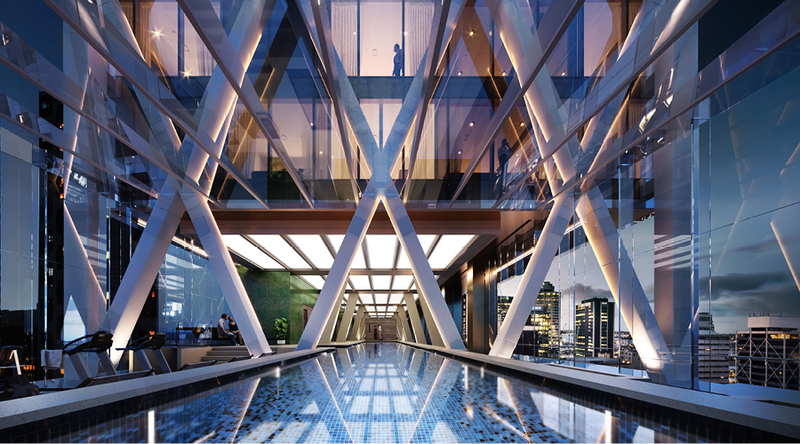 To put 187 metres into perspective, the majority of the building’s 52 floors will be dedicated to 221 apartments and studios, beginning with the opulent grand lobby on the first floor and finishing with the lavish and expansive 350-square-metre penthouse occupying the tower’s top two floors. 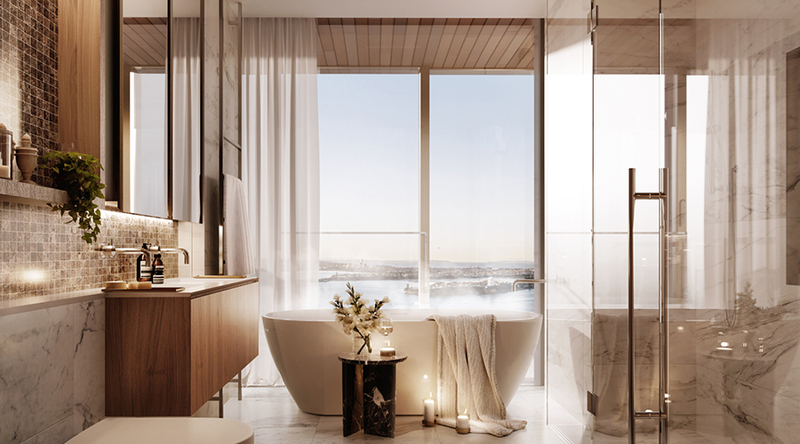 Epitomising luxury design, all of the penthouses will contain exclusive amenities such as splendid grand entries, extensive enclosable balconies, walk-in wardrobes and free-standing bathtubs — but there’s one feature in particular that really serves as a standout. 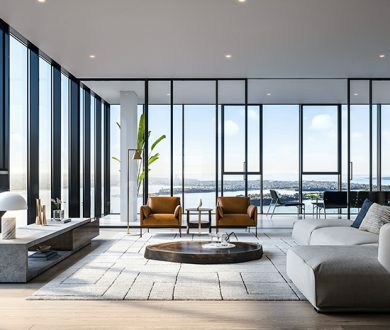 Floor-to-ceiling glass provides the ideal viewing platform to soak in the breathtaking panoramic views stretching out from Auckland Harbour Bridge, past the North Shore and Rangitoto, around to the Eastern Suburbs and Hobson Bay. 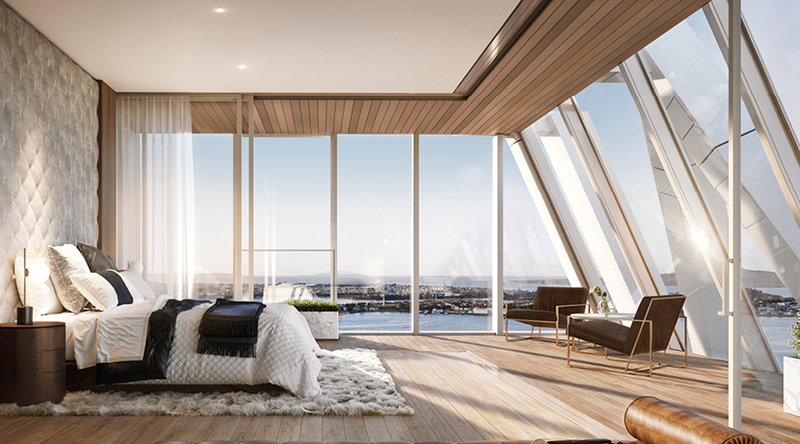 The sub-penthouses will begin on level 41 and finish on level 46, with two residing on each floor, while the penthouses will occupy an entire floor each. Levels eight to 40 will be dedicated to four types of apartments, ranging from one bedroom through to three bedrooms, as well as studios and 10 duplex apartments which are located in the centre of the tower. 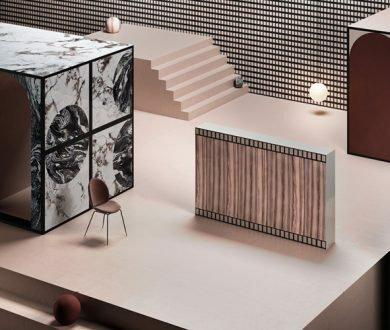 Offering the gold standard of apartment living, each of the premium apartments is designed to be vast and open-plan, adorned with opulent finishings such as golden wallpaper and sleek timber panelling. 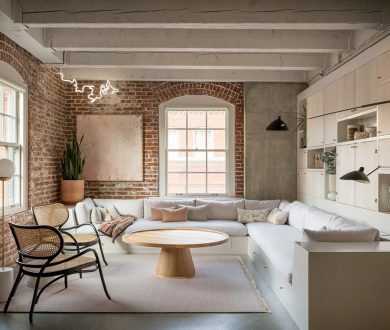 They will serve as contemporary and inviting homes, but with a few extra details — like the superior appliances and marble kitchen islands — and will also provide the perfect setups for hosting. It’s these finer details, found in every room, that really propel the apartments into a superior standard of living. In the bathrooms, you’ll find magnificent rainwater showers, designer tap-ware and underfloor heating all reminiscent of a luxury spa. It’s clear to see that with Seascape, no stone has been left unturned. Residents-only amenities within the building will include a pool and fitness facilities alongside an expansive podium terrace, furnished with built-in seating and lush foliage. Evocative of those found in modish cities such as Melbourne or New York, the outdoor terrace will serve as the ultimate place for evening frivolity. Upon entering Seascape, guests and residents will be met with an impressively grand, luxurious lobby where smooth marble tiling will be accompanied by shimmering gilded accents and eye-catching details. VIP parking and a restaurant will be available on the second and third floors, and shopping is made easy with a number of fine retail tenancies on the ground floor. 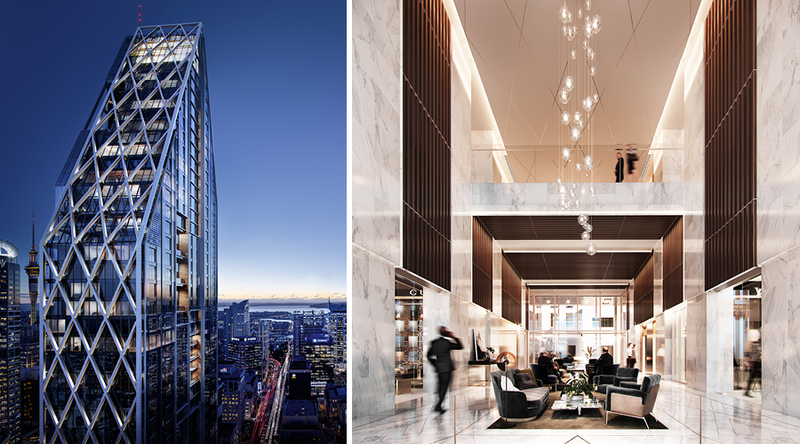 From the grand lobby to the penthouse suite, it’s evident that impeccable design and a fine-tuned attention to detail resides at the heart of this impressive residential tower. 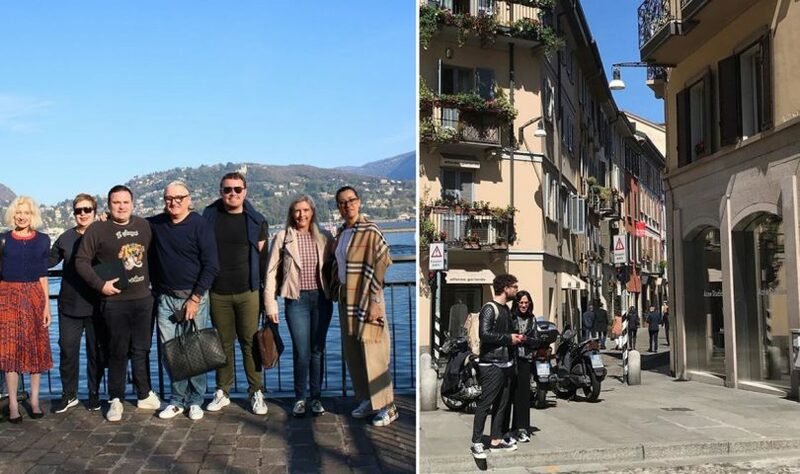 While it may have been a tough brief, the Shundi and Peddle Thorp teams have surpassed it and then some: creating a one of a kind building that’s truly worthy of its stunning surrounds.